by TIME SPACE SYSTEM Co., Ltd.
All the essential sentences for learning conversations in a foreign language have been collected and stored in one app! 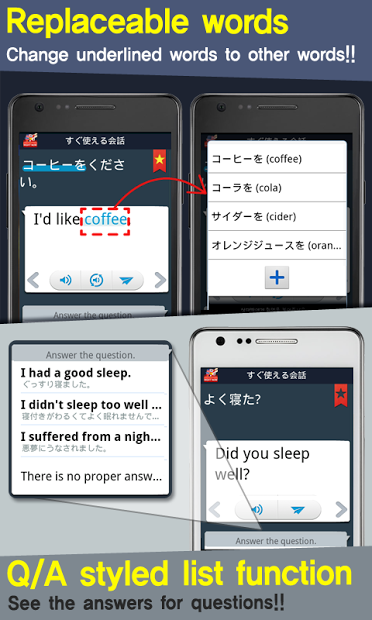 !★With the RightNow Conversation[10 lang] app(English, Korean,Japanese,Chinese,French,German,Spanish,Thai,Indonesian,Vietnamese), you can communicate with people in other cou... see more All the essential sentences for learning conversations in a foreign language have been collected and stored in one app!! (English, Korean,Japanese,Chinese,French,German,Spanish,Thai,Indonesian,Vietnamese), you can communicate with people in other countries, anywhere in the world. - As this app contains various categories and contextual sentences, you can communicate with people in other countries by taking full advantage of this app without additional material (phrase books, dictionaries, etc.). - You can easily change a word in a sentence. - You can add the widget on the home screen to study expressions whenever you want. - You are notified with conversation sentences every day at the time you set. - When traveling abroad or studying, you can save a sentence to Favorite sentences and use it whenever you want. - You can make a list of what you have learned in the Q&A form. - You can communicate with people in other countries by exchanging questions and answers. *Only available for a question sentence where the answer is provided. - You can learn word or expression while checking its pronunciation. - Show the screen to the person you are talking. The app automatically plays a native speaker&apos;s voice using the gyro sensor. - You can easily send or share a simple message in a foreign language via text message, e-mail or other instant messaging programs! - If you need to speak quickly, just say a word! You can find any sentence you want! Now it’s time to get away from the outdated conversation books and enjoy RightNow Conversation that guarantees your best travel experience yet!